I bought a Surface 3 with 4 GB of memory and 128 GB of storage. I believe Windows does better with more memory and storage, so I spent the extra $100 for them both. I passed on the LTE version and stuck with Wi-Fi only as the system price of $599 without LTE was already pushing the limit. The order also included the Type Cover keyboard and the pen. Those two accessories plus the extra memory pushed the total purchase price to almost $ 800 so this was not a casual purchase. I will be able to use the system for work so I was able to justify the cost. As excited as I am about getting to use the Surface 3 and Windows 10, it's not without concern. 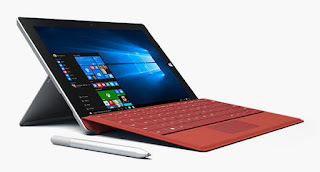 As a heavy tablet user, I hope the "desktop first" focus of Windows 10 does not bother me. My colleague Mary Branscombe found this to be unfortunate and rolled back to Windows 8.1 as a result of this and other changes. Like Branscombe, I rather liked Windows 8.1 and the front and center tablet support. I'll see how it goes when I get my hands on the Surface 3.